(Nanowerk News) After several years of controversy, there is now a general consensus that the bandgap of indium nitride -- a group-III nitride semiconductor -- is between 0.7 and 0.9 eV. Its attractive electron-transport properties and narrow bandgap make this material a promising candidate for the production of novel ultrahigh-frequency optoelectronic devices for terahertz communications. Producing nanosized InN structures raises the possibility of fabricating devices whose operation is based on quantum effects. 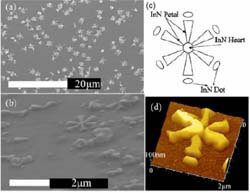 However, InN nanostructures grown from either indium chloride or indium oxide by metal organic chemical vapour deposition (MOCVD) often contain unwanted impurities. Now, Ting-Ting Kang and colleagues (in Appl. Phys. Lett. (2006)) from the Chinese Academy of Sciences in Beijing have grown hexagonal InN 'nanoflowers' by a 'self-catalysis' method that does not require either of these precursors or any foreign catalysts. In this process, hydrogen gas is deliberately introduced during MOCVD growth to promote the formation of metallic indium, which acts as a catalyst for the formation of InN. Although hydrogen is known to hinder the growth of InN by MOCVD processes, careful control of its flow rate allows the synthesis to proceed. These results shed new light on the growth mechanism of InN by MOCVD and will be important for the synthesis of novel nanometre-scale InN device structures.